IPL 2019: KXIP won the match by 17 runs. 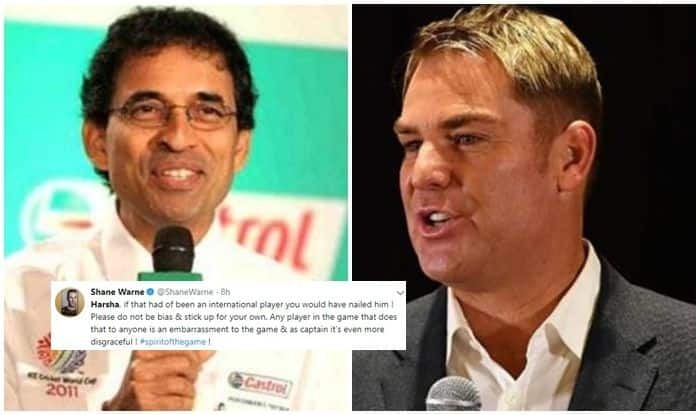 IPL 2019: Former Australian legend Shane Warne has always been a straight talker and this time too, he did not beat around the bush as he accused commentator Harsha Bhogle of being ‘bias’ in the ‘Ashwin’s Mankad’ controversy. Amidst the big mankad row, Harsha took to Twitter to remind fans of the great performances by Chris Gayle, Jos Butler, Sarfaraz Khan and that the controversy should not steal the limelight away from the brilliant performances. This did not go down well with the Royals coach Shane Warne who came down hard on Harsha. It did not end there. Harsha was asked a question on the rule by a fan and he responded. Warne commented on his response to a fan as well. “Nothing in the laws though about warning. Just as there is nothing in the laws about a wicket keeper warning a batsman for being out of the crease and not stumping him,” read Harsha’s reply to a fan.